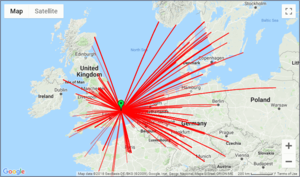 Beaconspot.uk uses manual spots and dxcluster reception reports to create a current picture of microwave and VHF/UHF beacons in Europe. Instigated by UKuG for microwave beacons, it has since been expanded to VHF/UHF (and globally for 6m beacons) , covering 50 MHz to 76 GHz. Maps show beacon distribution by band, and spots coverage of every beacon. DXCluster incoming real time spots are collected, and outgoing spots can be sent to the DXCluster.